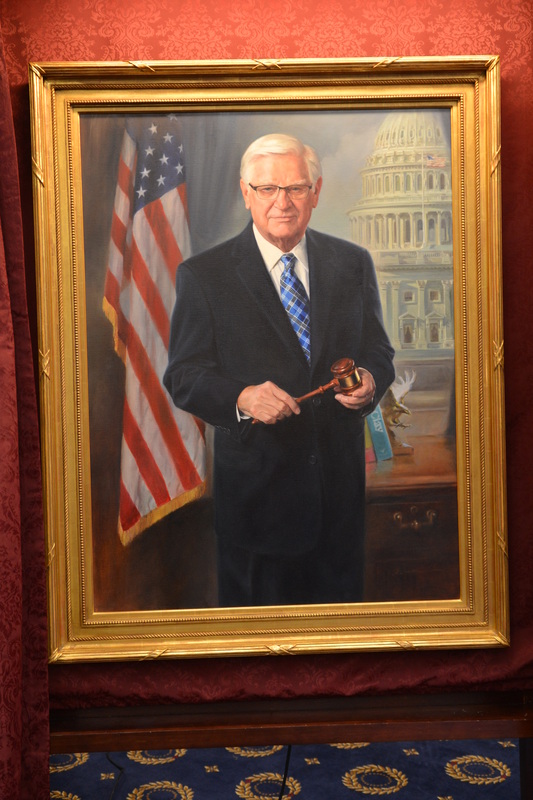 WASHINGTON, DC - A hand-painted portrait of U.S. Rep. Harold "Hal" Rogers (KY-05) was unveiled today in honor of his six years of service as the 31st Chairman of the U.S. House Appropriations Committee. His portrait will be displayed on the walls of the historic U.S. House Appropriations chambers along with 20 of the Committee's former chairmen. "I'm humbled and honored to join the ranks of such monumental figures in our nation's history," said Rogers. "Over the last six years, we have worked tirelessly to restore public trust in the federal funding process, cutting out waste while supporting programs that improve the lives of Americans. Marked improvements need to be made in the coming years to more effectively control spending, but I am proud of the work of this Committee since 2011." Rogers has been a member of the Appropriations Committee since 1983 and was tapped in December 2010 by the House GOP Steering Committee to take the helm of the nation's purse strings. Charged with the responsibility of managing the nation's entire discretionary budget, Chairman Rogers has proven to be an authority on cutting wasteful spending, enhancing transparency and restoring regular order to the appropriations process. Rogers navigated through a difficult economic climate, while remaining focused on the needs of his home district covering southern and eastern Kentucky. Under Chairman Rogers' leadership, the Committee has held 650 budget and oversight hearings and Republicans have cut the discretionary budget by $126 billion since fiscal year (FY) 2010. Appropriations action under the Republican House Majority will result in $2 trillion in discretionary outlay savings through FY 2026. Rogers is the third Kentuckian to serve as Chairman of the House Appropriations Committee. Congressman William Natcher (D) was chair for one term from 1993 to 1994 and Congressman J. Swager Sherley (D) was chair for a single term from 1918 to 1919, while Rogers is the first Republican. This year marks Rogers' sixth and final year as Chairman of the House Appropriations Committee. The GOP adopted a self-imposed six-year cap for committee chairmanships in 1994. Chairman Rogers' portrait was painted by artist, Leslie Bowman.